In Hawai‘i the island is your classroom, your workplace and where you can hone your practical skills to advance your career. Simply put Hawai‘i is the Best Classroom in the World! Check out the amazing opportunities available to students below. Did you know these facts about Hawai‘i? ✓ Work with the Keck Observatory, Canada-France-Hawai‘i Telescopes and NASA during your Astronomy Course – where else could you do this? ✓ Take part in internships in forestry providing unique work experience in tropical rainforests – in what other native English speaking location could you do this? The Cost of Living in Hawai‘i is cheaper than in San Francisco or New York and Hawai‘i is consistently ranked as the Happiest State in the US? 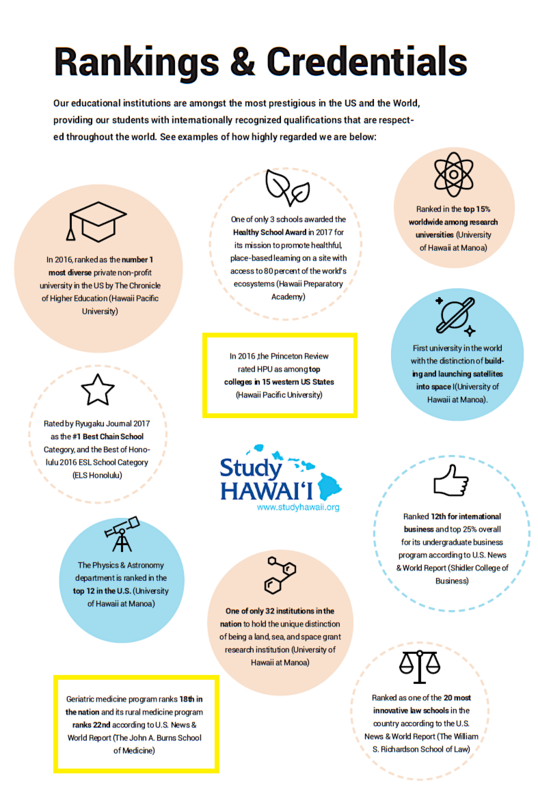 To find out more information about our institutions and what makes Hawai‘i the Best Classroom in the World simply download our brochure. Inside you will find key information about research, volunteer and internship opportunities available in Hawai‘i that will give you real practical experience that will benefit your future career.